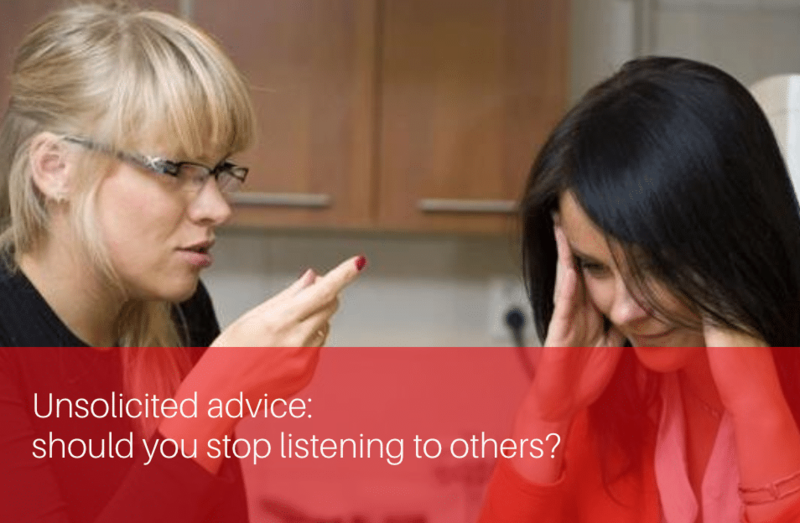 Home » Unsolicited advice: should you stop listening to others? Have you ever noticed how often people come up to you with unsolicited advice? They have opinions on everything from the way your desk is set up to the way you dress or what you should or should not say. The truth is, it happens to us all, but it seems to happen more frequently to women. While I was doing some reading for my post on ways women can make their voices count, I came across an article which resonated with me. While the article was supposed to be about making our voices count, many of the interview comments pointed to the unsolicited advice we women receive. #1. While it might seem trivial, unsolicited advice has an impact on us. Firstly, it feels like criticism, even if that wasn’t intended. It makes us question ourselves and re-evaluate our thoughts and opinions. As if we don’t have enough trouble making our voices heard, now we’re likely to be more cautious and hesitant about what we say. Secondly, it shows an unconscious bias which implies women can’t make decisions or look after themselves, particularly in the workplace. I say that because most of the advice comes from men. There was a study done years ago which showed men are far more likely to give unsolicited advice than women – even if the woman held a higher status. It seems to be part of the way they work; they like to solve what they see as a problem, even if the problem doesn’t really exist. #2. Why do people offer unsolicited advice? In most cases, the advice giver believes they are doing a great thing by helping you out. Sometimes, though, there are other motives. The person could be trying to control your performance. He could feel as though he needs to compete with you and offering advice is a kind of one-upmanship. Or he could be feeling a lack of confidence, and offering advice is a way of proving to himself that he knows what he’s doing. #3. How do you deal with it? The most important thing to do is to maintain your headspace. Don’t allow yourself to assume the advice giver’s opinion is more credible than your own. Also, stay in control of your emotions. Don’t allow anger, embarrassment or worry make you act in a way that’s less than professional. As with any unsolicited advice or criticism, when you’re weighing its merits, ask yourself these questions. What experience or credibility does this person have to offer such advice? Is the advice born of fact or opinion? What are the consequences of accepting or rejecting the advice? How does the advice fit with my intentions and my values? #4. You don’t have to accept unsolicited advice. You’re a leader. You know what you’re doing. You are in this role because you have proven yourself and your abilities. You’re a confident woman and you don’t have to welcome or accept advice unless you chose to. There are ways to manage the situation delicately. #5. Speak up if you need help. You might be feeling uncomfortable about handling this kind of situation, especially if the advice giver is senior to you or influential in your organisation. Working with a mentor can help you manage your mental and emotional responses and reinforce your confidence. Your mentor can also help you craft the perfect response to the kinds of advice you might be offered. As your mentor, I will help you manage this unwelcome situation you’re facing while still maintaining a positive relationship with the advice giver. Give me a call today and we can get started. And remember, you are where you are for a very good reason. You don’t have to change just because someone tells you that you should. Stay strong and believe in yourself.